Engage: NAMIC engages with industry collaborators such as start-ups, SMEs, LLEs and MNCs. Structure: With a problem statement defined, NAMIC then works with our research partners. Co-fund: The project will be co-funded by NAMIC and company. We understand that as companies need to continuously innovate in order to grow market share and maintain market leadership, innovation takes on a crucial role. This might require a fast validation of a concept, design, or process using additive manufacturing. NAMIC encourages companies (start-ups, or otherwise) to apply for Rapid Concept Funding (RCF), up to a maximum amount of $25,000 for the abovementioned purposes. We understand the speed of business. RCF results will be available within 2 weeks of submission. For more in-depth undertakings, NAMIC will work with partners from both a technical and business perspective. 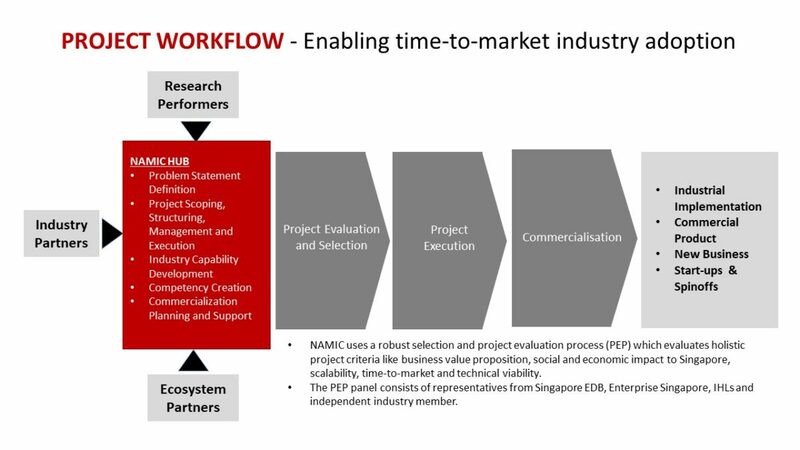 NAMIC is Enterprise Singapore’s Approved-In-Principle (AIP) Partner for AM-related CDG Project. It aims to accelerate AM commercialization and scale-up in the private sector. Who qualifies for NAMIC co-funding? All industry collaborators (start-ups, SMEs, LLEs, MNCs) who wish to explore Additive Manufacturing in the respective business domain. Project Initiation – Develop technical and business need, identify the research partner, assist in the project proposal submission. Project Execution – Manage the project to ensure a successful completion. Project Commercialization – Develop viable commercialization plan. What type of project is eligible for the co-funding? We support both industry and translational projects that explore the potential application and commercialization of Additive Manufacturing technology. The project’s duration should not exceed 24 months. NAMIC partners closely with Singapore Economic Development Board (EDB), Enterprise Singapore, SMF (Singapore Manufacturing Federation), NTU SC3DP, NUS Centre for Additive Manufacturing (AM.NUS), SUTD DManD, A*STAR, Polytechnics (NYP, TP, SP, RP), trade associations, local and global 3D printing company leaders and many others. Each project will be evaluated by NAMIC’s panel members. We invite the project team that applies for Full Project Funding to present at NAMIC’s monthly project meeting. How long does it take to get the co-funding approval? It typically takes around 12 weeks from the first engagement, depending on complexities and resource availability. Do I need to buy 3D printer for the project? No. NAMIC will leverage the IHL and/or RI’s existing 3D printing centre and infrastructure. Who will own the Intellectual Property (IP)? The IP ownership is largely based on the inventive contribution. Please click here for the project proposal form. Ms. Huang Xiaohui, Cindy: cindy_huang@ntu.edu.sg (Hub Manager, NAMIC @ NTU). Dr. Ooi Thian Ngan: ooi@nus.edu.sg (Hub Manager, NAMIC @ NUS). Mr. Eric Teh: eric_teh@sutd.edu.sg (Hub Manager, NAMIC @ SUTD). 3. For more information, please leave us your details here (Contact Us) so that we can assist you accordingly. For more information, please leave us your details here (Contact Us) so that we can assist you accordingly.